The Hop electronic fare payment system is one of the most innovative in the world, and just weeks after its public launch, thousands of riders in the Portland-Vancouver region are tapping to hop on! We just reached a milestone for this new system – half a million taps! But we’re just getting started, and we’re inviting you along for the ride! Hop is the new ticket to ride across the Portland-Vancouver region. To get started, just buy a Hop a card ($3) at our growing network of retail outlets, then load value and you’re good to go. Hop works like a gift card, so adding funds is quick and easy – whether you do it in store with cash, online at myhopcard.com, using the Hop mobile app or by calling 1-844-MYHOPCARD. One of the key benefits of Hop is the ability to earn passes. Gone are the days when you need to buy a day or month pass in advance. With Hop, you earn as you go. Tap for two trips (more than 2 ½ hours apart), earn a day pass. Rack up 20 day passes within a calendar month – ride the rest of the month for free. In addition, the money you don’t use remains on your Hop card. You only pay for the rides you take! Our fare inspectors have equipment that scan Hop cards for proof of fare. Your last tap will indicate whether your fare is current. At the same time, Hop keeps your most personal information safe. Bank data is stored at the bank – not the card. When a registered card is lost or stolen – funds can be frozen and transferred to a new card. As soon as you know the card is missing, report it by logging into your account via the Hop website, the Hop app or by phone, and your money will be safe. 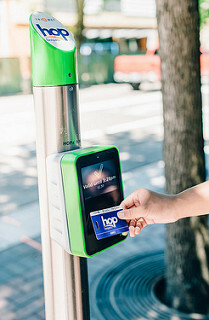 Hop uses cutting-edge technology that allows you to use your phone as your Adult fare. If Android Pay, Apple Pay or Samsung Pay is setup on your device – just tap it to the Hop reader, and once you see the confirmation screen (or hear the ding) – you’re good to go! There’s no card, no registration necessary. Mobile wallet taps can still help you earn Adult day passes but month passes are for Hop cardholders only. Whether you go by bus, light rail, commuter train or streetcar – Hop is a better way to pay!